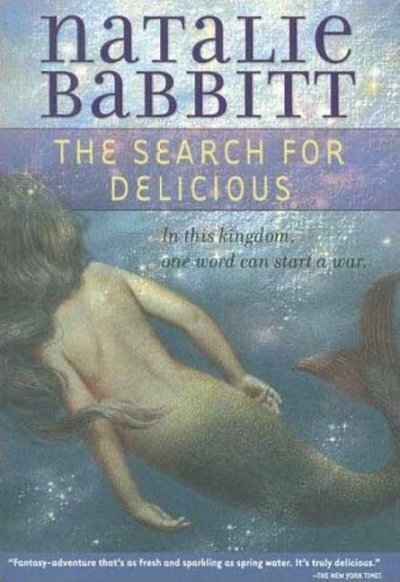 The Search for Delicious is an old childhood favorite by Natalie Babbitt, the author best known for Tuck Everlasting. It was written with younger children in mind, and the story sounds downright silly. The Prime Minister, DeCree, is writing a dictionary. The King and Queen are happy with “Affectionate is your dog” and “Bulky is a big bag of boxes” and “Calamitous is saying no to the king,” but take issue with “Delicious is fried fish.” No, says the King. He isn’t a fan of fish. It’s apples. No, says the Queen. It’s Christmas pudding. No, says the Queen’s brother, it’s nuts — and he storms out of the castle. The result of all this fuss? DeCree’s young Special Assistant, Galen, is tasked with travelling the kingdom and polling the people as to what they consider delicious. At least, that’s part of it. There’s another, older story. It’s the story that began before the people came, and its characters are the dwarves, the winds, the woldweller — who lives in the exact and precise center of the forest – and Ardis. When the Queen’s brother, Hemlock, uses the poll as a way to rile up the people and pit them against each other and the King, these others only say “It’s nothing to me.” People and their kingdoms come and go. Soon, Galen’s poll becomes impossible, and he finds himself having to track down the woldweller and the rest. Hemlock knows their story, and it’s that knowledge that’s the key to thwarting his schemes. What did the dwarves do, all those ages ago? Why doesn’t the key fit any locks? Who is Ardis, anyway? Ardis comes through in the end, and helps defeat Hemlock — or does she? Everyone agrees on a definition for Delicious at last, so it’s peace — or is it? The Search for Delicious is about how silly people’s arguments can be, and how much importance they can attach to meaningless things. However, it’s also about how important even those silly arguments can be when you’re right there in the middle of them. This is a sweet and funny vintage fantasy that leaves you guessing. It was fun for me to read as a child and as an adult, and I’m sure children today would like it just as well as I did. What is Hemlock’s real name? Has it ever been revealed?